Girls just want to have fun! The It's A Girl Thing bounce house is a great addition to any birthday party, celebration, fundraiser, or event in the Lafayette area! Celebrate being a girl in 200 square feet of bouncing space with a basketball goal! 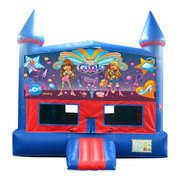 (2 balls Included) The It’s A Girl Thing bounce house is available for rent in the Lafayette and the surronding areas. Get all your It's A Girl Thing fans together because this party is going to rock. There's a large colorful It's A Girl Thing graphic right over the entrance to greet all your friends.